Saudi Basic Industries Corporation (Sabic), the world’s biggest petrochemicals maker by market value, has recently linked and united all its businesses and functions worldwide to firmly establish itself as the preferred world leader in chemicals with six strategic business units to effectively serve customers globally. Sabic’s investment in building a strong global brand starts with its own people and their delivery of ‘Chemistry that matters’, the group’s new tagline. It is equally about employees’ growth and development, and building strong relationships with the wider world. Sabic’s values have always been central to its success and now play an even more important role. They power productive interactions and emotional connections, leading to more empowered and engaged employees, says Sabic vice chairman and CEO Mohammed Al Mady. “Sabic has transformed into a global entity enriched by different cultures and different ways of thinking. Today, irrespective of where employees are located or their cultural heritage, a common set of values bind them and sets the foundation for Sabic’s future growth and development. These values will allow Sabic to achieve further success as it collaborates worldwide. It is a duty for each of us within the company to put our brand at the heart of everything we do,” says Al Mady. The new tagline, Chemistry that matters, demonstrates a renewed focus on creating long-term relationships that deliver profitable growth and success. It represents Sabic’s commitment toward partnering closely with customers, employees, suppliers, and the communities in which Sabic operates, powering mutual success and growth. “Chemistry that matters, unites and inspires us all by capturing the true essence of Sabic,” says Al Mady. Over the past 24 months, we’ve listened closely to what matters most to our stakeholders, and have co-created a solid new foundation and positioning for our brand and organization. We are investing in our brand long-term, and adding three key ingredients to our formula for success -- a strong global call to action, a renewed emphasis on existing Sabic values that guide our behaviour and delivery, and a new identity and visual system to boldly project our brand and our company worldwide. Delivering Chemistry that matters Al Mady comments: “Chemistry that matters is both the commitment we make, and our own call to action to focus on what matters most: the strength of the relationships we build, and the positive impact we make. The new tagline is the most visible part of Sabic’s ongoing investment in building a strong global brand, by shaping a consistent customer experience that creates a collaborative relationship from the start. It is further amplified by a dynamic new visual identity and system. This commitment to deliver combined with a spirit of ingenuity has been with Sabic ever since building its first petrochemicals plant in the desert 35 years ago. Since then, Sabic has grown rapidly into a global business and is currently the 2nd largest diversified chemicals company in the world. Meanwhile, the company has also begun work on a $100 million technology centre in Shanghai, focusing on alternative energy and new materials for the construction and auto sectors, which is part of a wider expansion that includes a polycarbonate production complex in Tianjin, a city in northeastern China as part of its joint venture with Sinopec, Asia’s biggest refiner. Al Mady says the centre would focus on helping design and create next generation alternative energy vehicles. The company, which manufactures fertilisers, metals and polymers, has seen strong sales and solid profits on the back of higher oil prices. Sabic is one of the world’s largest chemical producers and its investments in China are part of a bigger energy partnership that includes a buildup of jointly run refineries as well as petrochemicals plants. The development of China’s electronics, automotive, building materials and new energy sectors is boosting demand for polycarbonates and other engineering plastics. China produced only 220,000 metric tonnes of polycarbonate in 2010, importing most of the 1.13 million metric tonnes consumed by its industries. Even as China’s growth slows, its national economic plans call for nurturing various “new industries” such as renewable energy and electric vehicles. “Material sustainability is key to the creation of new applications across industries,” Saudi Prince Saud bin Abdullah bin Thenayan Al Saud says. The new research centre, in Shanghai’s developing research hub of Kangqiao, will share Sabic’s research, design and production capacity with Chinese industries, he says. Meanwhile, Moody’s Investors Services has affirmed the A1 senior unsecured ratings of Sabic and its guaranteed subsidiary Sabic Capital, and concurrently upgraded Sabic’s baseline credit assessment (BCA) to a1 from a2. The rating outlook is stable. The upgrade of the BCA reflects the sustained improvement in operating performance and financial metrics reported by Sabic following the completion of a number of key growth projects, which have contributed to enhance its overall revenue and cash generating capacity while trading conditions in the chemicals markets strongly recovered from the sharp downturn of late 2008/early 2009. Concurrently, the affirmation of Sabic’s A1 rating and removal of the one-notch uplift relative to the BCA reflects the moderate distinction maintained by Moody’s between the ratings of the Kingdom of Saudi Arabia (KSA) and those of its strongly supported government-related issuers (GRIs). In 2011, Sabic successfully completed a major capex expansion programme, which had seen the group invest in excess of $30 billion in the previous five years (equivalent to nearly 20 per cent of group revenues). The commissioning of the Yansab, Sharq and Saudi Kayan facilities and ensuing production ramp-up, helped fuel further volumes growth. In 2011, Sabic reported total production of over 69 million metric tonnes, as its KSA facilities operated at close to full capacity, while utilisation rates at its international foreign affiliates, Sabic Innovative Plastics and Sabic Europe, further recovered and topped 80 per cent. Against the relatively benign trading conditions and favourable pricing environment that have been prevailing within the petrochemical sector in recent years, this has enabled Sabic to report significant growth in operating profitability and cash flow. In the past year, the group has reported funds from operations ranging between SR54 and SR57 billion ($14.6-15.3 billion) on a last twelve-month basis. Following an extended period of negative free cash flow, this increase in operating results in parallel with capex falling back to an annual average of SR11 billion, has allowed Sabic to generate a substantial cumulative cash surplus close to SR17 billion ($4.5 billion) since the start of 2011, despite the recent marked step-up in dividend payout. Sabic has been able to reduce net debt by 27 per cent to SR49.7 billion (on a fully adjusted basis) in the same period. Looking forward, Moody’s cautions that the downward pressures on product pricing witnessed in the petrochemicals markets in recent quarters may intensify going into 2013, as new capacity is expected to come on stream at a time when global economic growth conditions are uncertain. That said, Sabic is well equipped to withstand any sector downturn given its highly competitive cost position that is underpinned by the significant economies of scale afforded by its world-scale vertically integrated facilities as well as its access to significantly cost-advantaged feedstock sourced under long-term contracts with 100 per cent government-owned Saudi Aramco. 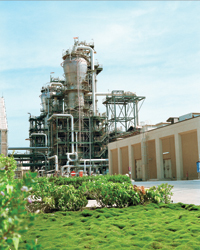 Therefore, Moody’s considers that Sabic’s enhanced cash flow generating capacity boosted by the incremental contributions from its recently commissioned facilities combined with lower capex (in the region of 10 per cent of sales) and benefits accruing from working capital initiatives, will enable the group to sustain, at least in part, the significant recovery in credit metrics reported in the past eighteen months, during which retained cash flow (RCF) to net debt averaged around 60 per cent. The a1 BCA is predicated on Moody’s expectation that Sabic will be able to accommodate its 2020 growth strategy (including potential bolt-on acquisitions) and stepped-up cash distributions to shareholders, while maintaining strong credit metrics (such as RCF to net debt in the mid-40s level and net debt to EBITDA close to 1.0 x) and keeping comfortably free cash flow positive through the cycle. Since its formation by royal decree in 1976 as a venture tasked with using the natural gas created as a byproduct of oil production, Sabic’s growth has been impressive. With total assets of about $89 billion and 40,000 employees, it is the 88th largest company in the world, according to Forbes, with a market capitalisation of more than $73 billion. The government owns 70 per cent of the company’s shares, which are traded on the Saudi stock exchange, open to ownership by private investors from Saudi Arabia and the Gulf states. The kingdom’s stock market is closed to the rest of the world, but discussions are under way to change this. In that transition, Sabic, the largest public company in the Arab world, will probably tickle the fancy of international institutional investors, analysts say. When that happens, its image and brand will take on a new significance. This year, the company’s shares have fallen 4 per cent to SR92 ($24.5). Sabic posted a SR7.3 billion profit in the first quarter, a 5 per cent decrease from the same period a year ago. The drop was caused by lower demand from China, highlighting that as the company has grown geographically, its exposure to global demand fluctuations has increased, making its performance closely connected to that of the world economy. Although prices also affect profits, it is rising production volumes that remain the focus for equity analysts. Those analysts point to a fresh challenge. As domestic gas consumption increases in Saudi Arabia and competition for the gas becomes tougher, Sabic will have to look further afield or develop more efficient ways to use it. Dow Chemical, a US competitor, signed a $20 billion deal with Saudi Arabia’s Aramco last year to build a petrochemical complex in the industrial city of Jubail. “The mandate was to convert gas into cash – the question going forward is what next, now that the gas is spoken for?” asks Sriharsha Pappu, director of chemical research at HSBC in Dubai. Analysts wonder whether Sabic will respond with a spending spree abroad, adding to its three leading international acquisitions over the past 10 years. They also say the company may look to invest more in the US, where the shale gas revolution offers good prospects. With three large projects recently coming online, Sabic could end up searching for new opportunities to invest its growing cash pile in. “Every chemical banker in the world has probably gone to Riyadh and pitched deals to them,” says Pappu. Sabic started its significant international acquisitions in 2002 with the purchase of DSM Petrochemicals, expanding its business into Germany and the Netherlands. It then went on to acquire Huntsman’s European base chemical business. In 2007 the company captured international attention with the $11.6 billion acquisition of GE Plastics, one of the biggest acquisition deals from the region. More recently Sabic has expanded in China through a joint venture with Sinopec. With the government as the main shareholder, how Sabic’s state mandate develops will be crucial to the company’s next decade. How it looks to secure its future feedstock will determine where its tentacles are likely to spread, particularly in an era when natural gas is becoming abundant in parts of the world barely on the production map when the company was founded. Meanwhile in the third quarter, Sabic posted a 23 per cent decline in profit as prices for its products dropped amid slower global economic growth.